The Hollinwood Canal is derelict and navigation is no longer possible. 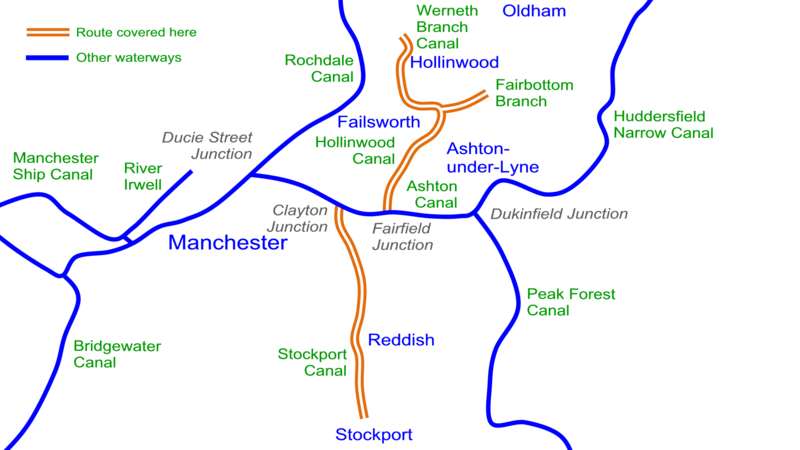 It ran to the east of Manchester, heading generally northwards from the Ashton Canal at Fairfield Junction. The Fairbottom Branch ran to the east and the separate Werneth Branch Canal extended the route to the north. The Hollinwood Canal initially runs through urban areas, then through open countryside until it returning to an urban environment as it reaches Hollinwood. NOTE: Bridges figures are for opening bridges (lift, swing etc.) which are normally closed across the navigation and low enough to require opening for a narrowboat.